City officials are going nuts. They can't figure out how Toronto managed to lose 57,000 jobs during the last two months. This past August unemployment in the city was 7.1%. Fast forward to October and unemployment rate skyrocketed to 9.8%. 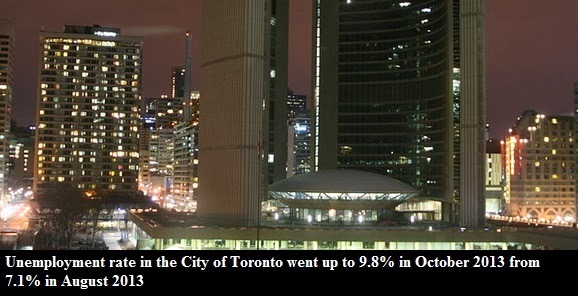 This jump doesn't make sense because the unemployment rate in the "905" was declining during the same time span. Additionally, TTC ridership actually increased during the past two months and the number of jobs advertised grew as well. Both have high correlations with the LFS posted rate. Did Toronto really lose 57,000 jobs during the past two months? City officials have contacted Statistics Canada to double check their data. You can read the full report (pdf) on this matter here. In my opinion, I think this is just statistical noise. As you can see on the graph above, the unemployment rate for the city is much more volatile compared to the "905". Who knows - only time will tell.